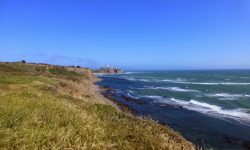 Home Posts tagged "Devils Slide"
San Mateo County Parks offer many wonderful ways to enjoy a romantic outing with your special someone. Bring a picnic lunch and take advantage of any number of benches and tables offering gorgeous views in scenic settings. Take advantage of the many trails that are sure to make your date swoon. We have compiled some of our favorite spots for dates and encourage you to share your ideas with us as well.